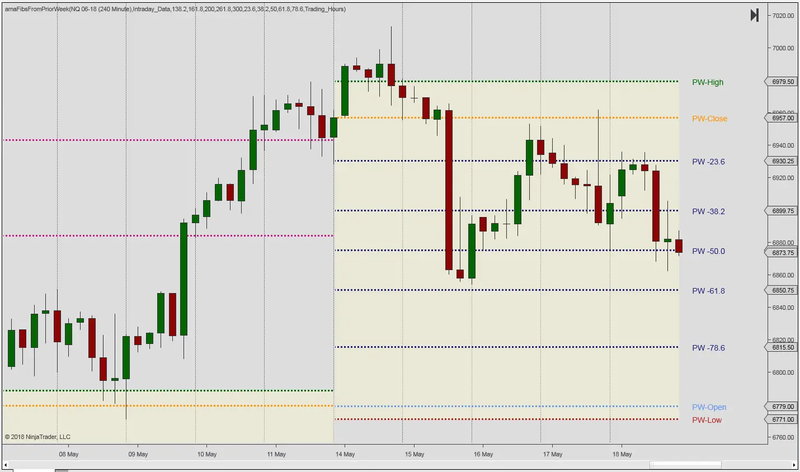 The Fibs from Prior Week display Fibonacci retracements and expansions calculated from the prior week high and low. The high and low points can be measured from daily data or from intraday data. 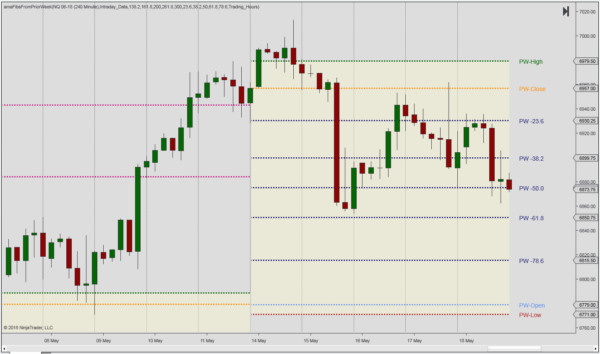 The Fibs from Prior Week can be defined individually. In the event that you’d like to eliminate certain levels, the value for these lines can be set to zero. If you want additional retracement or expansion levels, you may do so by adding several instances of the Fibs from Prior Week indicator to your chart. Fibonacci retracements refer to areas of support or resistance levels calculated by using the Fibonacci sequence. A central concept here is what’s called the Golden Ratio, which refers to 1.618 and it’s inverse .618. The Italian mathematician, Leonardo Fibonacci (1170-1250), is credited for bringing the sequence to the West. He discovered that certain ratios could be calculated, corresponding to “divine ratios” found throughout nature, architecture and art. Fibonacci levels are used to identify potential reversal and extension scenarios. Following a strong uptrend, the levels are used to predict the extent of a pullback. One may use the same approach during a downtrend, i.e. evaluating how far a counter-trend bounce may retrace. The Fibonacci levels from the current day are found by measuring the distance between the day high / low and dividing the vertical distance by the key Fibonacci ratios. The most commonly used retracement levels are 38.2% and 61.8%. Although the 50% retracement is not part of the Fibonacci sequence, it is almost always included as a point of reference (half the range).